Issues important to the philosophy of social science are widely discussed in the American academy today. Some social scientists resist the very idea of a debate on general issues. They continue to focus on behaviorist and positivist criteria, and the concepts, methods, and theories appropriate to a particular and narrow form of scientific inquiry. McCarthy argues that a new and valuable perspective may be gained on these questions through a return to philosophical debates surrounding the origins and development of nineteenth- and twentieth-century German sociology. 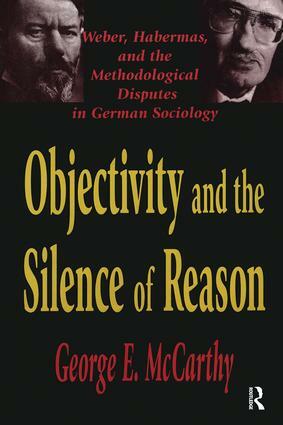 In Objectivity and the Silence of Reason he focuses on two key figures, Max Weber and Jurrgen Habermas, reopening the vibrant and rich intellectual dispute about knowledge and truth in epistemology and concept formation, logic of analysis, and methodology in the social sciences. He uses this debate to explore the forms of objectivity in everyday experience and science, and the relations between science, ethics, and politics. McCarthy analyzes the tension in Weber's work between his early methodological writings with their emphasis on interpretive science, subjective intentionality, cultural and historical meaning and the later works that emphasize issues of explanatory science, natural causality, social prediction, and nomological law. While arguing for a value-free science, Weber was highly critical of the disenchanted and meaningless world of technical reason and rejected positivist objectivity. McCarthy shows how Habermas attempted to resolve tensions in Weber's work by clarifying the relationship between the methods of subjective interpretation and objective causality. Habermas believes that social science cannot be silent in the face of alienation, false consciousness, and the oppression of technological and administrative rationality and must adopt methodologies connected to the broader ethical and political questions of the day. Drawing deeply on the Kantian and neo-Kantian tradition that contributed to the development of Weber's method, Objectivity and the Silence of Reason demonstrates the crucial integration of philosophy and sociology in German intellectual culture. It elucidates the complexities of the development of modern social science. The book will be of interest to sociologists, philosophers, and intellectual historians.